Life without access to energy is simply miserable. 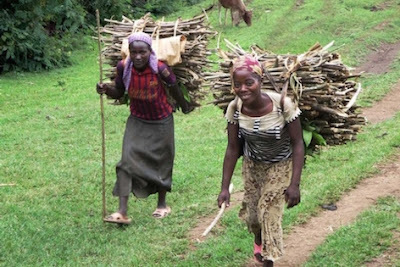 The most mundane task, such as heating water to cook rice, can require an entire day’s labor to gather both water and firewood. That labor can be physically exhausting, in some cases immediately dangerous, and often with unfortunate health outcomes. With over one billion people around the world faced with such simple barriers to improving their lives, reducing energy poverty can serve as a shared goal that transcends political, cultural, and regional barriers. Accessing energy is the single most important factor in improving the lives of individuals and increasing the economic opportunities available in their communities. Access to lighting transforms education from outdoors during the day, to indoors and anytime! A simple refrigerator can transform a fruit stand to a grocery store. Reliable electricity allows businesses to stay open and ultimately provides the cornerstone that allows industries to form. There is a dominant school of thought that energy access can be achieved around the world with only carbon-free sources. This paradigm envisions effectively “leapfrogging” traditional development patterns, skipping industrialization, and transforming economies with green energy and a service economy. While compelling in theory, this vision lacks several critical factors: the need to manufacture the goods that will build the economy, the scalability of energy sources, and the affordability of that energy. The developing world will gain access to energy. This transformation is currently underway and its progress is inevitable. The urgency is created by individuals’ current, difficult conditions and the availability of abundant, affordable energy, particularly coal. All new energy demand will come from the developing world. Without a thoughtful conversation about the projected doubling of world energy demand, energy consumption will continue as it is currently underway, in two parallel paths. One path prioritizes carbon-free sources, and sets goals and policies that incentivize those. The other path responds to the supply and demand inherent in a world economy and is resulting in the massive development of coal-fired electricity generation. The reality of energy development can be summarized in the example of India’s projected energy development. By 2022, India is planning 100 GW of new solar and a relatively tiny 50 MW of new coal. However, a simple calculation of the likely emissions of these two new sources of energy conducted by a colleague at Stanford indicates that if all this new electricity generation came from natural gas, the result would be 20 percent fewer emissions. This is a conversation worth having. Although not a carbon-free source, natural gas has a transformative role to play in the energizing of developing nations. Abundantly available around the world, and more transportable than ever, a world natural gas market is creating a more stable, affordable supply. As an electricity generation fuel, it is both a baseload alternative to coal and a backup for renewable generation. In this capacity, natural gas provides carbon and non-carbon air emissions benefits. When used as a transportation fuel, natural gas provides significant air quality benefit to traditional fuels and can be equally affordable. When deployed as a cooking fuel, liquefied petroleum gas (LPG), provides dramatic health benefits and could reduce the unnecessary 4 million annual deaths attributed to cooking over inefficient, biomass fuels. As an economic cornerstone, natural gas can empower industrial development as a chemical feedstock, fertilizer component, direct energy source, and electricity provider. Trying to boost energy development without fossil fuels creates a critical conundrum. Natural gas cannot improve individual, community, and country outcomes without planning. Natural gas is expensive to develop and requires the appropriate scale to create affordable results for consumers. To realize the benefits of natural gas, we must be willing to acknowledge the possibilities and tradeoffs of this relatively better fossil energy source. Which isn’t to recommend that natural gas be given a blank check. Appropriate development of natural gas requires thoughtfully navigating its development challenges to ensure it is produced responsibly, priced appropriately, and delivered reliably. Thoughtful planning must address market conditions, import-versus-export balances, appropriate regulatory and taxation schemes, and appropriate infrastructure planning. Natural gas has a vital role to play in allowing many developing countries, particularly those in Asia and East Africa, to reach their potential. Whether one’s primary motivating goal is addressing climate change, creating the conditions for economic prosperity, or raising the world’s most vulnerable out of crippling poverty, a conversation about natural gas is worth having. It’s time to leave behind the antiquated notions of vilifying fossil fuels and instead having a thoughtful, meaningful conversation about real needs and realistic solutions. I agree with Tisha as the adage the "good is not the enemy of the perfect" applies to find practical answers to energy poverty in developing countries. Natural gas and LPG are good alternatives to and wind and solar because they are much more reliable and cheaper. The environmental problem of energy poverty is urgent affecting the lives of millions. A priority is for families suffering from cookstove pollution from burning wood, brush, dung and other biomass. It is foolhardy and immoral for rich nations to deny poor nations the major benefits of fossil fuel energy to save lives. Recent studies show this is the most devastating environmental problem today. See the landmark Global Burden of Disease study showing 3.5 million annual deaths from respiratory disease from outside fires.Cooking on traditional cookstoves is a far greater risk factor than poor water and sanitation, lead or radon pollution, or smog (ozone) and outdoor soot, according to the study. http://energyblog.nationalgeographic.com/2012/12/13/cookstove-smoke-is-largest-environmental-threat-global-health-study-finds/ To remedy this crisis we must consider natural gas as an intermediate solution with its advantages over both coal and renewables.